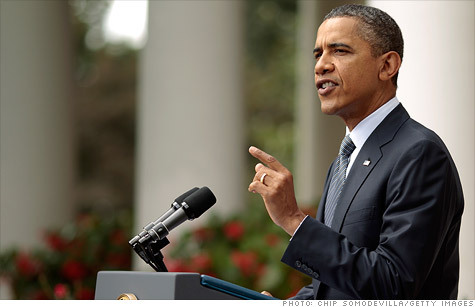 President Obama is expected to announce new measures to help college graduates facing student loans on Wednesday. WASHINGTON (CNNMoney) -- The White House announced on Tuesday two new measures the Department of Education will start offering in January to help college graduates climb out of their student loan debt hole. One of the proposals would push up the start date for more favorable terms on a special loan repayment program based on income, said White House domestic policy adviser Melody Barnes. Another measure would encourage graduates with two or more different kinds of federal loans to consolidate them and get a small break on interest rates. Obama is expected to trumpet them when he appears Wednesday at the University of Colorado's Denver campus. "We're using executive authority. . .stepping into a gap, at no cost to the taxpayer, creating a program that creates additional relief to the students," Barnes said. The president is under pressure to address the financial concerns faced by students and recent graduates. Student loan debt, which is now outpacing credit card debt, is one of the problems called out at Occupy Wall Street demonstrations in New York. Average student loan debt for the graduating class of 2009 at four-year nonprofit colleges was $24,000, including all private and federal loans, according to the Institute for College Access & Success. In 2010, the unemployment rate for college graduates age 24 and younger rose to 9.4%, the highest since the Labor Department began keeping records in 1985. However, the White House announcement doesn't offer much new help for existing borrowers who are already eligible for the income-based repayment plan and who have been able to consolidate federal loans for more than a year, said Mark Kantrowitz, publisher of FinAid.org. "It preserves the cost of the loans," Kantrowitz said. "And existing borrowers who are up to their eyebrows in debt, they don't get the benefit" of the lower payments on the income-based repayment plan. One of the Obama proposals would advance the start date for a special loan repayment program based on income that aims to help struggling graduates. The Income-Based Repayment Plan is not well-known, higher education experts say. The way it works now is that graduates who enroll get charged 15% of their monthly discretionary income to pay off loans, with debt forgiven after 25 years. Congress passed a law set to go into effect in 2014 that would drop the monthly payment for loans originated that year to 10% of discretionary income and would forgive all debt after 20 years. The Obama administration would improve on the law by fast-forwarding the new terms to take effect in 2012 on loans originated that year, Barnes said. U.S. Secretary of Education Arne Duncan said his agency has regulatory power to move up the start date. He said the move would save current students originating loans next year hundreds of dollars a year. The bright spot for struggling graduates is that the monthly payments are based on any income above 150% of the poverty line. For a graduate living alone, the payments would be on 15% of any dollars made above $16,335, based on the 2011 poverty line. And unemployed graduates with no income would owe no monthly payments on their student loans, education experts say. That's a big win for students at risk for default. According to Department of Education numbers, the default rate rose to 8.8% in 2010, up from 7% in 2009. Default on student loans is a big deal, because student loan debt follows consumers even through bankruptcy. "We need to get the word out to students, especially students who are delinquent on student loans, that they need not default," said Justin Draeger, president of the the National Association of Student Financial Aid Administrators. So far, about 450,000 students are enrolled in the income-based repayment plan, but hundreds of thousands more are eligible for the repayment plan based on 15% of income earned with the debt forgiven in 25 years. "The biggest challenge is making sure borrowers know it's available," said Pauline Abernathy, vice president of the Institute for College Access & Success. The other proposal would encourage graduates with two or more different kinds of federal loans to consolidate their loans giving them a small interest rate break of .5%, Barnes said. Last year, the federal government got out of the business of guaranteeing student loans made by private banks called Federal Family Education Loans -- including Stafford loans -- and moved to start offering loans directly to students. But lots of graduates are still paying off those federally backed loans, originated by private student lenders such as Sallie Mae and Nelnet. The federal government wants students with both direct loans and federally backed loans to consolidate all their federal loans into direct loans. Students with both types of loans have been able to consolidate their loans into direct loans for the past year. But students really didn't have a financial incentive since the interest rate is the same for a Federal Family Education Loan and a Direct student loan. But now the White House says it will for a "limited time" offer a .5% interest rate break for all students who consolidate their loans into a direct loan. The Department of Education makes money by taking over the Federal Family Education Loans, so they can offer students the interest rate break without costing the taxpayers. Another benefit for student loan borrowers who convert into direct loans is that they'd qualify for other debt forgiveness programs if they work in public service or at nonprofits for ten years. Should I consolidate my student loans in one big loan?